The much-hyped, highly anticipated film American Hustle turned out to be way too much hustle about not too much substance. David O. Russel piles on another one for this Academy season. 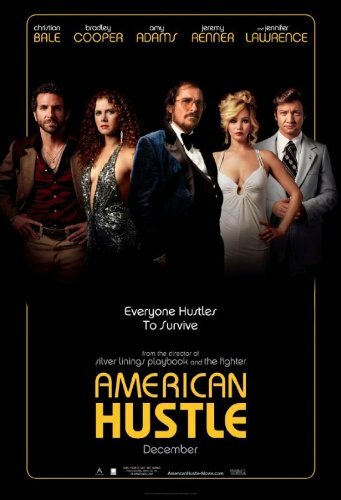 Just like his mediocre but amazingly successful Silver Linings Playbook from last year, American Hustle offers a lot of big, modern names, a giant promise, an intriguing story, tremendous media hype but not much else. There is a lot of hustle but no big payoff. But, for what its worth, you get at least two great performances. Amy Adams is brilliant as a mercurial woman desperately trying to break out of the rut. She will likely win the Best Actress Oscar this year. She certainly should. Christian Bale, as a small-time con man suddenly thrust into the world that's much bigger than he is used to, is simply amazing. He put on 50 pounds for this film and speaks in a great Jersey/New York accent. For a guy from Wales, England, he is certainly the most amazingly versatile actor we've got working right now. His best actor Oscar seems locked-in as well. The film is till worth watching for the performances, the soundtrack and the general 70s throwback storyline even if you don't come out feeling great. There is still something to be said about a film with big names that isn't the usual Hollywood fairytale of superheroes, science fiction or natural disaster.